Purpose: Use this document as a reference for running the Grade Lapse process in ctcLink. Use the Find an Existing Value tab to search for an existing Run Control ID, or create a new one. a. Click the Add a New Value tab. b. Enter a unique Run Control ID. On the Grade Lapse page, enter the request parameters. Institution: Select a value from the drop-down list (e.g. WA220 for Tacoma Community College). Career: Select or enter a Career. Term: Select or enter a Term (e.g. 2145 for summer 2014). Lapse Deadline: Enter a date (e.g. today’s date). 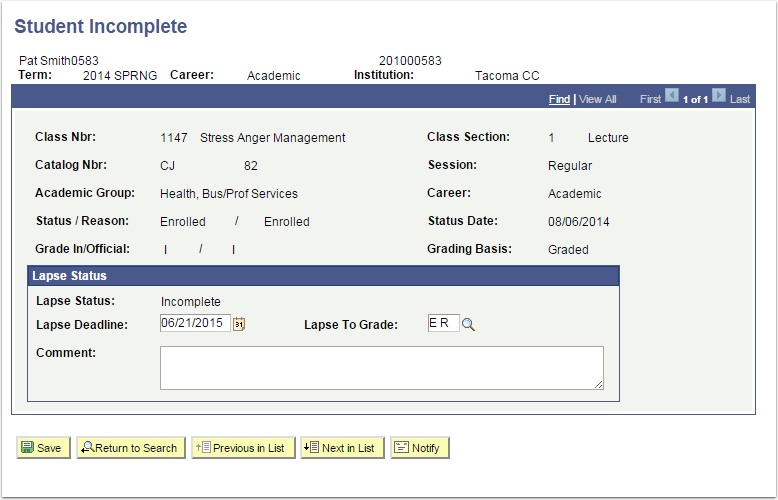 The lapse deadline represents the last day that the student has to complete the incomplete. 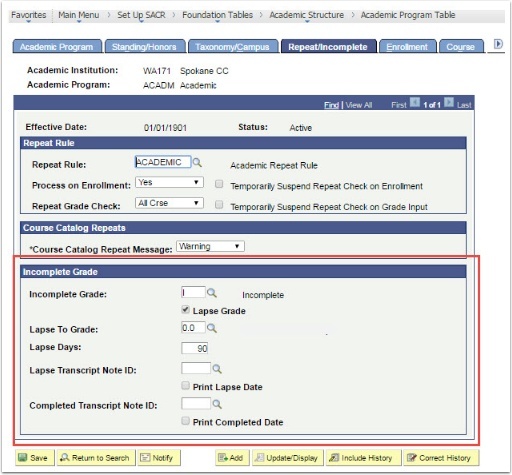 The Lapse Deadline must be later than or equal to the fully graded date from the Term Calendar 3 page plus the lapse days that are identified on the incomplete page in the Academic Program Table component. 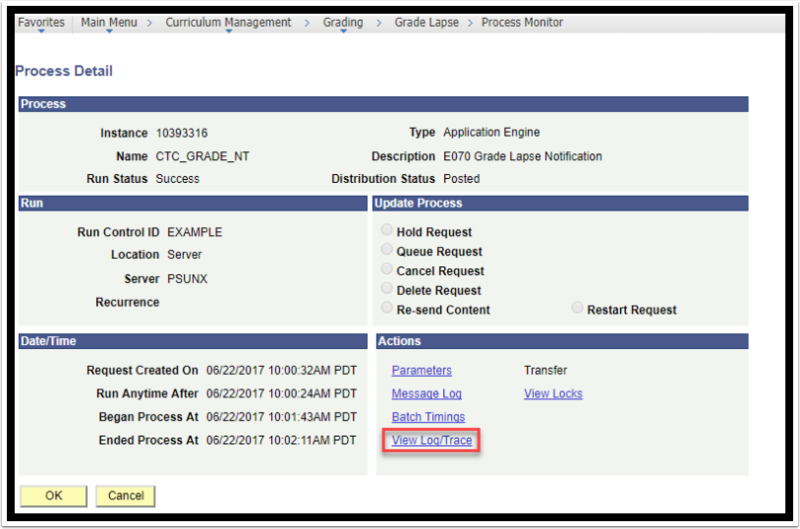 Select the E070 Grade Lapse Notification (This process includes the grade lapse as well as notifications to students and instructors. 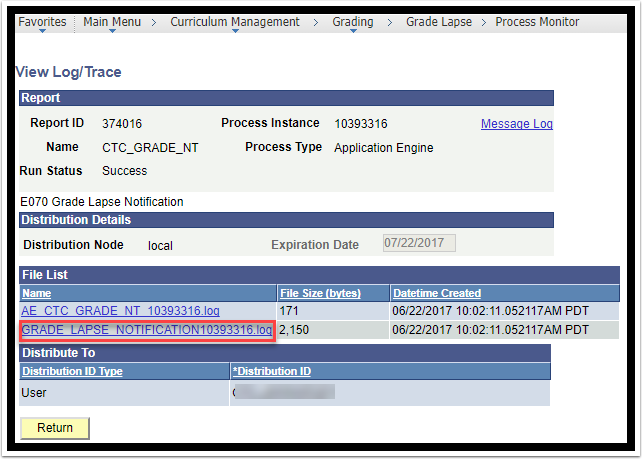 If a user selects the Grade Lapse Process box instead, the process will lapse grades, but there will not be any notifications sent.) and click OK.
Click the Process Monitor link. The process may take time to run based on the quantity of records being processed. Continue to click Refresh to update the Run Status until it shows "Success". After the Run Status has run to Success, click the Process Name CTC_GRDE link. Click the CTC Grade NT Success link. 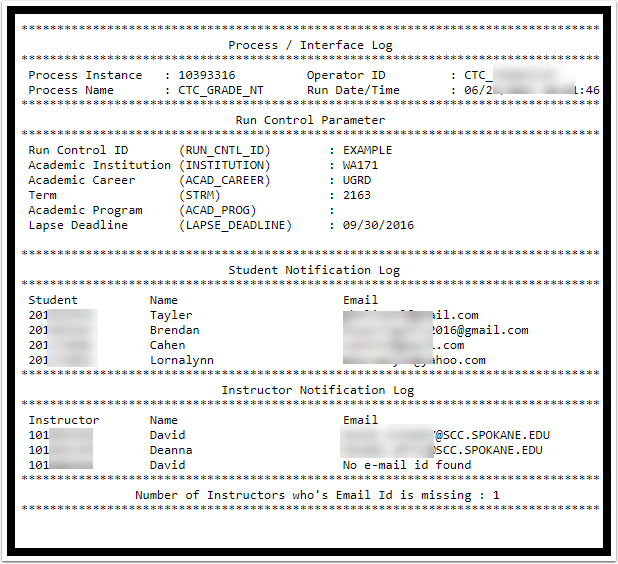 Click the Grade Lapse Notification log file. 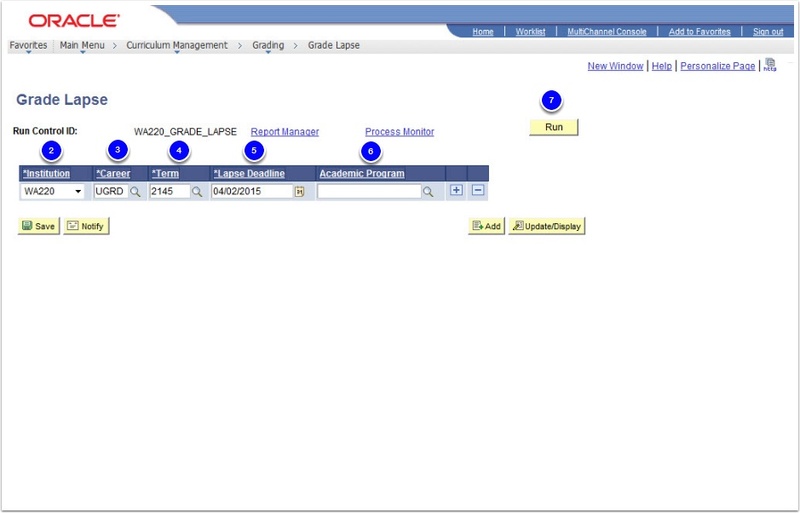 Note: A user can view the students and instructors that were notified of the grade lapse in the Process / Interface Log. 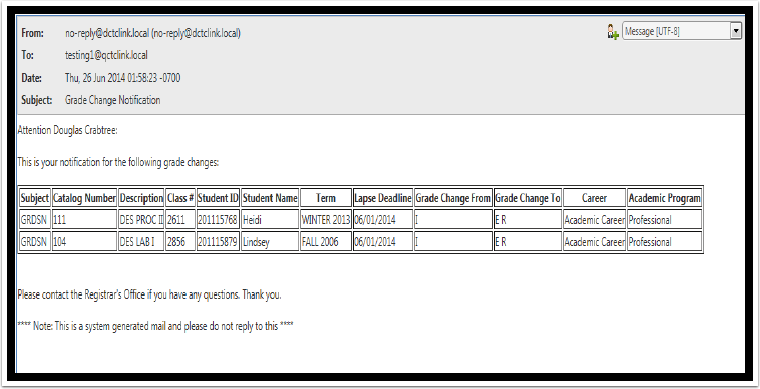 Example email notification to a Student in image below. 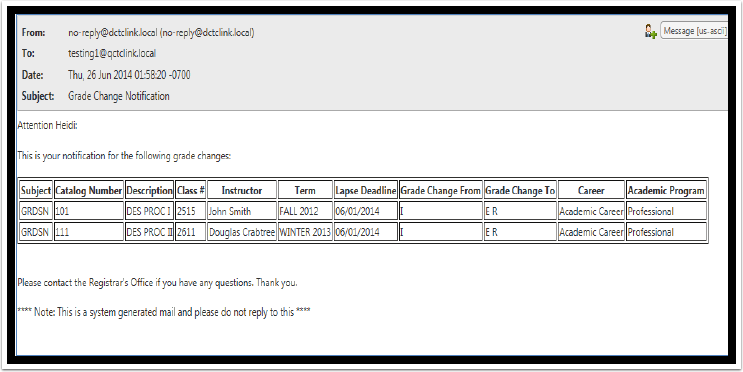 Example email notification to an Instructor in image below. 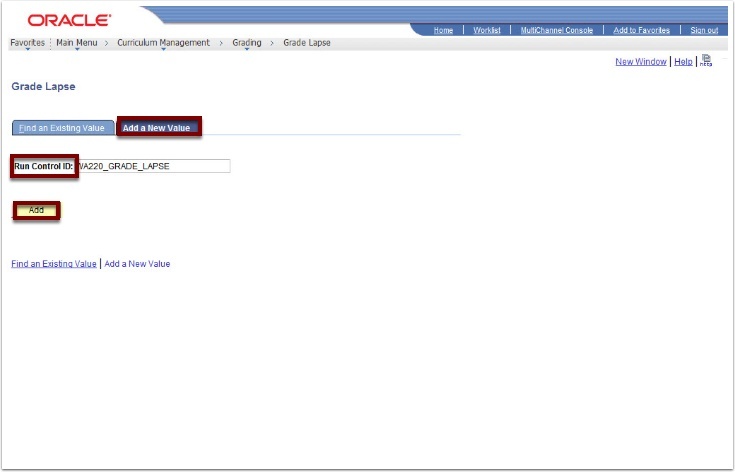 The Lapse Grade process does not pick up "I" incomplete grades when entered on the Enrollment page (Main>Records and Enrollment>Enroll Students>Enrollment) It is advised to follow up this process by running incomplete grade queries such as QCS_SR_INCOMPL_GRADES to verify all grades lapsed as expected. 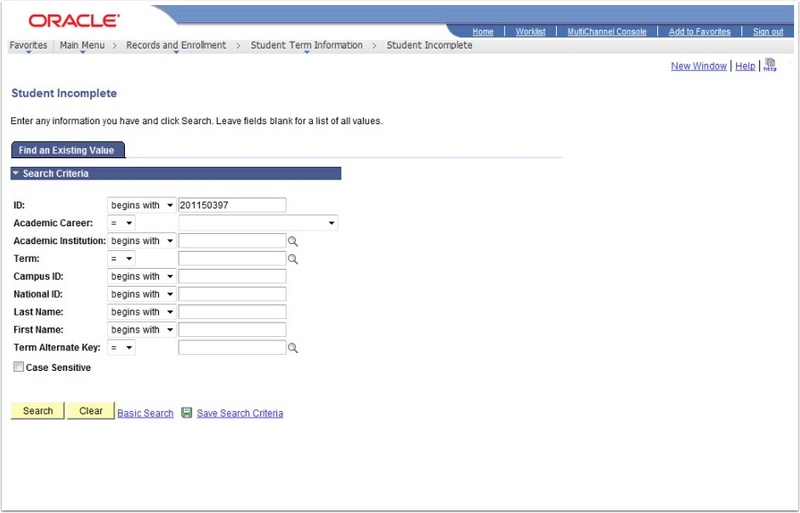 On the Student Incomplete page, enter a student’s ID in the ID field (e.g.201150397). Review the Grade Lapse results for that student. Define grade lapse rules for academic programs. Each rule defines the grade that your incomplete grades lapse to when you run the report and what related transcript notes (if any) appear on a student's transcript.